My husband and I have used our Mark V now on three trips and will use it again next week at Glacier. 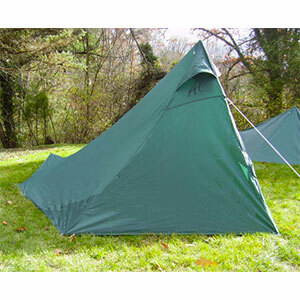 It is a single wall backpacking tent. It is light weight and easy to erect. We have slept in the rain and wind in it and also in some sub-zero temps and it was fine. With just the two of us the vents take care of condensation. It does not have a floor so we have used an all purpose plastic emergency blanket as the ground cover. I have fashioned a slightly larger one of black 4 mil carpenter plastic for our Glacier National Park trip. That is larger and slightly lighter. One minor issue at Lake Chelan, WA. We camped in a damp part of the campground and at 3 a.m. my husband awoke with a large slug crawling across his face and bald head. Several slugs had invaded under the edge of the tent. We camped in the snow in the Grand Tetons without any slugs attacks. Have also used it at the Bowl and Pitcher state park near our home in Spokane. Lots of room inside to put your pack, etc. You can set muddy boots on the ground next to your ground cloth without getting anything else messed up. We used this tent numerous times in the last two years both in the backcountry and at regular campgrounds in the Inland Northwest. We used on a 5-night backcountry trip in Glacier National Park and have camped at other car camping sites in Glacier as well. No other slug attacks or bothersome creatures since Lake Chelan. If it looks like there will be a gap we now find a couple of rocks to put on the edge of the tent. We've not gotten wet or had any trouble with stability in two years. The material is durable and no holes or rips. There are no zippers, just velcro closures so there is very little to break or go wrong. I like that I can stand up in the tent and there is plenty of room. I do not have to crawl in on my hands and knees like a regular 2-man backpacking tent. 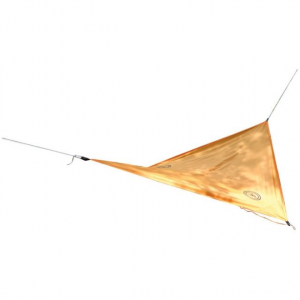 Without the poles and stakes the tent weighs less than 2 pounds. You do not need a pole if you want to suspend it from a tree or you can use a treking pole with an extension, but the ready made poles are easier for us to manage. 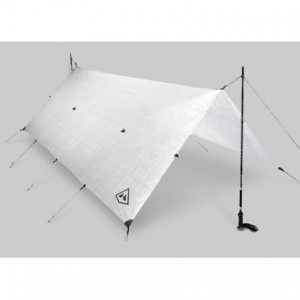 We are considering getting a carbon pole to replace the aluminum one which came with the tent and I am considering replacing the black plastic I use as a ground cloth with something even lighter, but it is already very light for the amount of space you have inside. 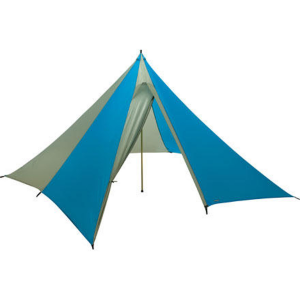 I have looked and looked for something as light and as comfortable and only find very cramped small tents at very high prices for the same weight. We'll keep our Mark V until something better comes along. Lightweight and a lot of room. I got this as a way of reducing my load on summer-friendly climate trips..
Well, I bought too much tent. This thing is big, and not just big but with an extraordinarily high peak, something like 5' high at the door. The tent is essentially a lightweight version of a tent once used by the Boy Scouts for events like Piedmont. It requires either the lightweight pole that is supplied or a trekking pole. The foot end requires a 12" aluminum rod that keeps that end of the tent off the ground. There is no protection from bugs (no screen of any kind) and the doors Velcro shut. Wind could in theory pull the doors open. As issued, this could be a problem in black fly season or much of anytime the mosquitos are out....which means pretty much always in New England. There are neither storm flaps nor a floor. As it comes from the factory, these shortcomings require surgery unless you are prepared to live with them. The bug issue may be less pressing if you do not live in the Northeast. 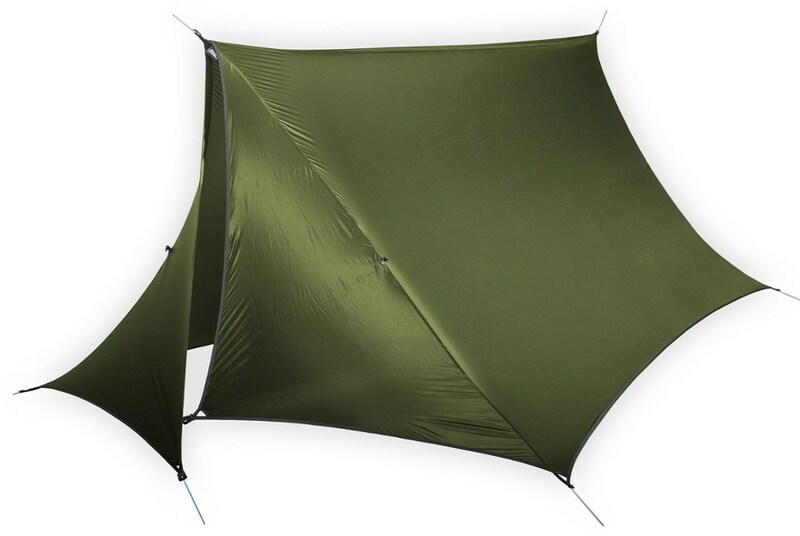 These shortcomings appear to be a way to get the cost down and as such would seem to be inherent in a tent that is intended to provide an ultra light at a low price. The extra material (and sewing time) to make up these deficits would have driven up the price. Literature that comes with the tent explains that these additions are really unnecessary. Maybe, but the manufacturer suggests carrying a separate floor, so the expense and weight comes into play elsewhere than the initial purchase price. To be fair, the manufacturer suggests low cost options for a floor, including plastic sheet and an emergency space blanket. As purchased, one of the tent peg loops was unattached at one end. The other loops were reinforced at the same time since I simply did not trust the stitching. I have not measured the stitching, but I think the count would be something like 6 stitches to the inch. The tent is alleged to house five adults, but unless you follow the diagram and have no equipment to take in, I have my doubts. I suspect that the five inhabitants would only be comfortable if they were corpses. Realistically, this is a three-person tent. After setting this up in the yard I decided that some of these deficits I could not ignore. I put in door ties and fashioned a screen door of sorts. It ties shut. I mounted the screen with ties on the inside edges of where the original doors are sewn. I added Velcro on the doors to make the seal a bit better, but it is not an answer to lack of a tight seal. I also installed some generous storm flaps out of lightweight nylon. I have yet to take this tent on any extended trips or for that matter even an extended weekend. On the whole, I plan at some point to do additional alterations. I prefer to be less obvious when camping, especially in high traffic places like the AT or LT. 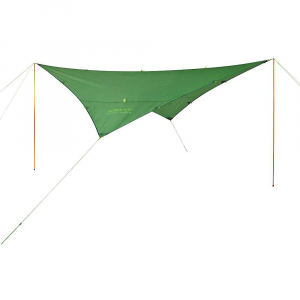 It should be easy to add additional tent stake loops and reduce the height and breadth of the tent. By folding under part of the walls in a permanent alteration, this would essentially provide a partial floor or storm flaps. 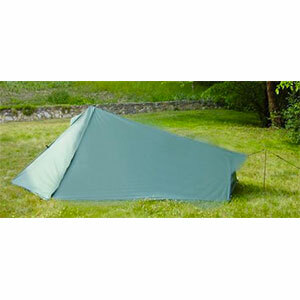 If you are happy living under a tarp but want a little more shelter, this or the smaller model may be the answer. Despite the defects, this is a good value. You could not even get a shaped tarp for this price. Come to think of it, you could probably consider this a shaped tarp. I hope you'll keep us posted on how this shelter works out on your trips, David. When I was a Scout leader, I saw ads for this brand all the time. I always wondered if they were a good deal or not. Thanks for the review. The Appy Trails Mark V is not available from the stores we monitor. It was last seen July 9, 2013	at Campmor.